In my session we spent some time doing a Visible Thinking Routine around 5 mathematical tasks, then did a run through of some quick ways to improve or attempt a mathematical task. Here are links to some of the tasks we looked at, and additional ones I provided as models for participants. As always, lots of Dan Meyer shoutouts. Thanks to Theresa Shafer for lending me her computer that has an HDMI connection. The teachers I work with are part of a school in which the entire staff is transitioning to Project-Based Learning (PBL). Granted, math teachers have traditionally been the most resistant – although this is beginning to shift. Anecdotally, I can report that there is less resistance to inquiry in math now than there was even a few years ago. We get essentially 4 consecutive days of professional development from the teacher’s onboarding into our network of schools. That’s a lot of up front professional development in the middle of summer. So feel free to take any or all of the recommendations I have with a grain of salt. It works for me. 1. Start with a simulation. Have the teachers fully take on the role of students for a start-to-finish mathematical task and debrief the experience afterward. Also, from my experience it helps to be pretty consistent about keeping participants in “simulation mode.” Participants in the simulation will want to ask questions about the process. Be pretty heavy handed about tabling the questions until the debrief. Every single second of PD should be spent reflecting on implementation and researching and creating lessons. Don’t sneak in test item analysis. Don’t spend time writing exams. You might even have to eschew district professional development to stay true to the cause. Preferably you have time in the summer to pay teachers to get together and start this work. During the year, pay for subs to watch classes while teachers observe other teachers facilitating inquiry lessons. And have a non-threatening observation protocol in hand. 4. Provide models. They’re out there. Find a couple that really sing to you. Have teachers find a couple that sing to them. 5. Provide cover. Give teachers permission to spend a bit more time with a standard, or shoot, go “standards-less” for a week or so. Teachers are still responsible for all their course’s content, but consider whittling down some of the bit standards or veer from the district’s scripted scope and sequence. 6. Make the implicit explicit. Both teachers and students should know the value of moving to an inquiry-based environment. Ideally, students should be able to discuss their own habits of a mathematician. Teachers should be able to speak fluently about how these lessons contribute. Don’t expect that students will be in the middle of a task and say “wow! I’m really learning how to move up the ladder of abstraction!”. 7. Develop a growth model for the year, and for the finish line. It’s difficult (impossible?) to go from 0% inquiry-based curriculum to 100% from the get-go. It’s not realistic, and probably foolish. Rather, establish concrete goals and next-steps. Maybe by the end of the year you’ll want to have implemented or developed five 3-Act style tasks. Maybe by the end of the first semester you’ll want to try one Shell Formative Assessment Lesson. Maybe you’ll want to try one video entry event in the first semester, two in the second. The end goal should be near-ubiquitous inquiry lessons. Craft a step-by-step path to get there. And know that different teachers will progress at different rates. I’ve been toying with some sort of “badging” system that adheres to growth-mindset and gives concrete “achievements” to unlock. Here’s a snippet of a few categories. 8. Let the calendar be your friend in Year 1. When’s the first time in your Algebra 1 scope and sequence that really lends itself to a complex mathematical task? Make it a good first shot. Don’t force it into the first week of school just because. 9. It’s all about reps. Whether facilitating the PD or facilitating the classroom, it’s going to take several iterations before the teachers and students feel comfortable with the inquiry-experience. 10. Debrief every experience possible. Every time you move up that growth model, debrief that experience. What worked? What didn’t? What would have made it better? Develop a way to persist through frustration for teachers and students. So there’s my thoughts on the matter. Hopefully some of it Adam finds useful. I’m sure there are countless other tips, warnings and methods to adhere to. When I queried him, friend, colleague, and expert in adaptive leadership Jim May (@jimamay) phrased it thusly: Be Fanatical about the End and Endlessly Flexible about what it Might Look Like to Get There. Presented without comment, from Scrubs episode 1:8, “My 15 Minutes”. A bit of performance evaluating from Dr. Cox. Kicking things off: How do I start the facilitation of a problem? So you’ve decided to undertake inquiry-based learning. That’s great. I’m really glad you see the inherent value in having students swim through a challenging problem on their own a bit before the teacher jumps in with instruction. I’m also glad you’ve been creative at creating new mathematical tasks with cool entry videos, perplexing pictures, and solid scenarios. Looks like you’ve got your curriculum mapped out, all ready to go for the 2013-2014 school year. Really, you’ve done incredible work this summer as you’ve restructured your curriculum with the help of awesome, engaging tasks from the MathTwitterBlogosphere. It’s fantastic. You’ve come a long way. You’ve shown tremendous agency. Now what? We’ve got all these nifty tasks tied to standards, but what do we actually, you know, do with them? Sadly, even though we’re all rowing the same direction with regards to inquiry based learning and complex mathematical task driven learning, your students are (probably) not at the place where you can just say “GO!” and they’ll spring in to action. Facilitation needs to happen. And while it’s great to have a protocol like the Know/Need-to-Know process (below) handy, if you’re doing 3-5 tasks per unit, any single protocol, no matter how effective, can get pretty boring after a couple rounds of it. While I do believe in giving students the power in common language, it needn’t be that common. Here are a few ways facilitate the transition from the entry event (the artifact or problem scenario that launches the task) to the student work time. 1. The Know/Need-to-Know Process (NTK). I’ve blogged a bit about the NTK process before. It’s certainly my go-to protocol. It works well when deconstructing longer (or wordy) problem scenarios. It’s got its problems though. If you’re not adept at facilitating the protocol or just leave it to the students to fill in some blanks, you’ll get some pretty crappy Need-to-Knows, heavy on logistics (when is it due?) or worthless Next-Steps (teach us how to do the math in this here problem). 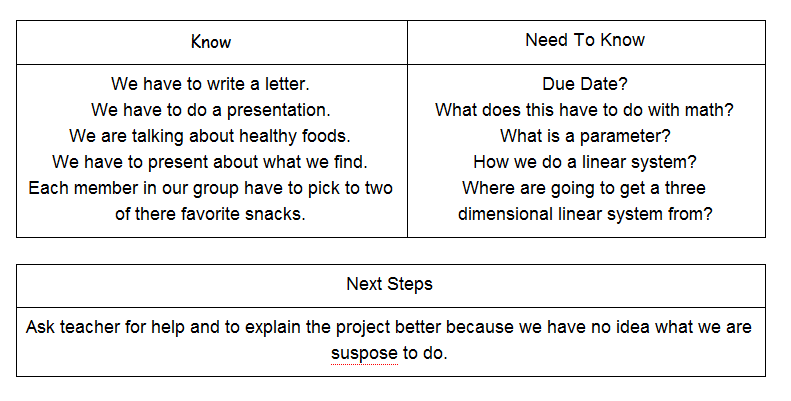 The point of the NTK process isn’t to establish how many words are in a written task, it’s to aggregate prior knowledge and begin brainstorming solution strategies. The good old “Do you have any questions?” “protocol”. Certainly one of the more fun ones. I’d suggest having students jot down their questions before aggregating them as a class. Dan Meyer does a nice job of this by adding “+1’s” when there’s a repeat question. Ideally you’ll have an overwhelming majority of students asking the same question. 2 1/2. Related: Jeff de Varona (@devaron3) does a nice bit about “what do you think I’m going to ask you?” after producing the problem scenario. I’ve never done that but it seems on point to me. Here’s an entirely stolen-and-published-without-permission of one of Jeff’s worksheets that has that little nugget in there. Also similar to #anyqs, but slightly more structured, STW was developed as a way of interpreting and discussing works of art, which, if you’ll allow me to opine, ought not to be so different from math problems. It also has the added bonus of adding a layer of evidence-based things the students notice about the picture or video that #anyqs sometimes lacks. 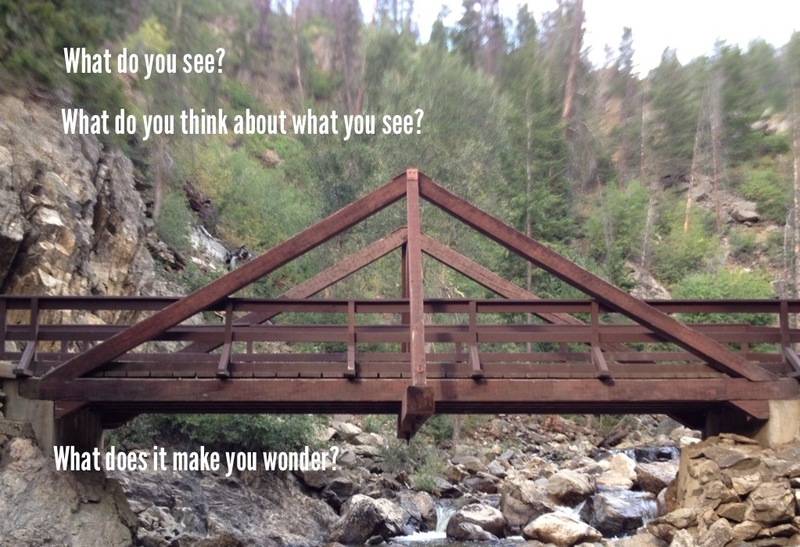 Students observe an artifact and discuss what they see, what they think about what they see, and what it makes them wonder. This protocol also works well when having students peer-evaluate each other’s work. I think many of us know the power of having students put some estimations up before launching in to the problem. See, they know how to do it over here. 5. 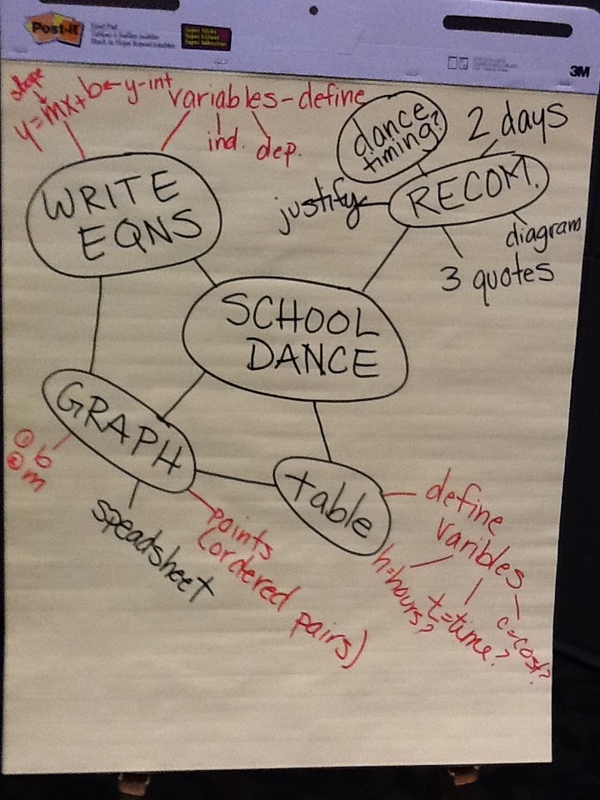 Have students develop a concept map before they begin working on a solution. This is a nice way of having students recall previous lessons and mathematical knowledge. It also helps to bin those logistical need-to-knows that often muck of the NTK process (above). 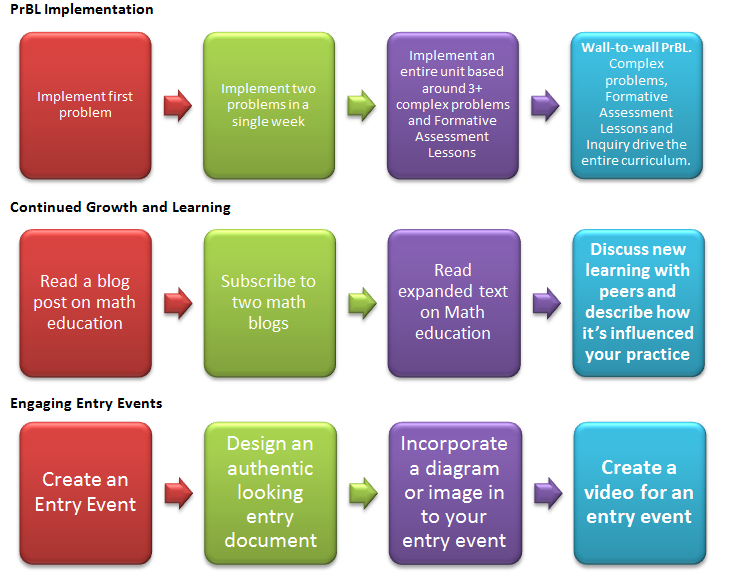 So there are 5 (and a half) quick ways to move from that awesome, engaging entry event of yours into actual mathematical work. What are some additional protocols or structures you have in your classroom to elicit mathematical strategery?